Reminder: If you buy this seat cover, we'll present you a pair of backseat organizer&1 piece of car sticker for free. Honestly, I can’t really express my joy and satisfaction of the product I got. It’s really amazing and satisfying.So cool. These are so comfortable! I am using these as an everyday seat cover. I was surprised to see that they stay in place by little silicone dots that cover the back and one clip that goes around the base of the headrest. 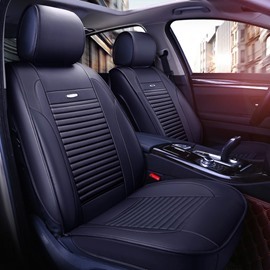 If you lived in the Palm Springs/Coachella Valley areas, from June to September and have an auto with Leather seats you'd be lauding the manufacturer of these terrific seat "covers". I can not imagine coming back to my car, which I left sitting in a parking lot for an hour or two? Bought these for my mom’s Hyundai Elantra and as soon as we got them in her car, I bought a set for my car!! When I first pulled them out of the box I thought they looked rather cheap but they are far from it! Liking these a lot. Mainly got to cover black leather seats in the summer but they are comfortable and look good. Fit 2017 Honda Ridgeline very well except pad seat width could be just a tad narrower to facilitate seat belt latching. Dear Customer, Thanks for your concern for our website. Sorry the item does not fit your car. You can choose one you like under the category of Truck Seat Covers on our website.Looking forward to your purchase. If you still have any questions, please contact us, we are sure to reply you as soon as possible. Best Regards, Customer Service Department. Will this fit a 2017 Honda CR-V? Dear Customer, Thanks for your concern for our website. The item fits your car. Looking forward to your purchase. If you still have any questions, please contact us, we are sure to reply you as soon as possible. Best Regards, Customer Service Department. Does this fit to my 2018 x3 m40i? Hi, would these fit a 2016 Hyundai Veloster Turbo? The back seat is a 2 seater with cup holders in between them. 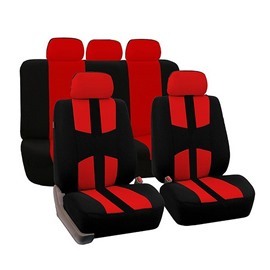 Hi I'm interested in this product (I want black and red color)..my car type is 2019 Toyota Corolla Ascent Sedan Passenger (rear seat 2 and 1. can be folded I need Leather Car Seat Cover Full Set fit) could be 11 pieces. just let me know if you can find it fit to my car! this is personal request I'm not dealer or business thank you with best regards.